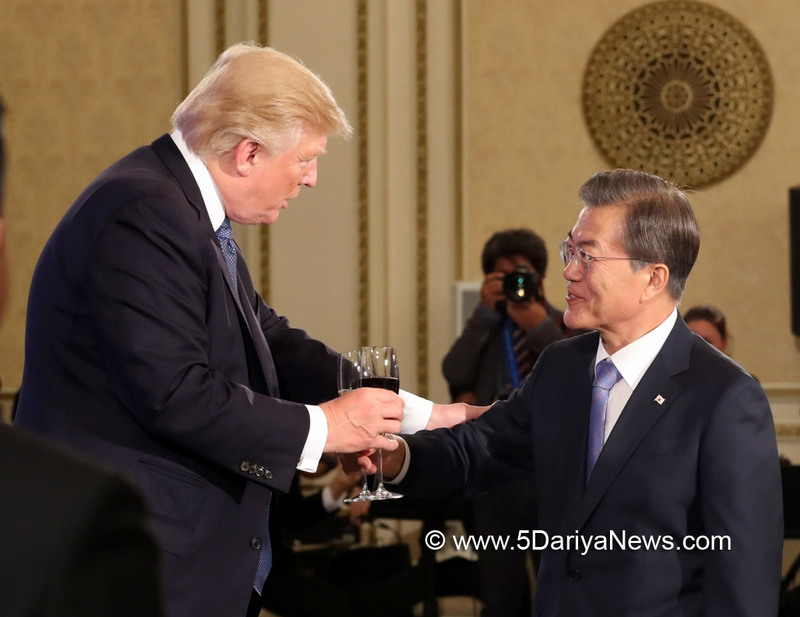 US President Donald Trump and his South Korean counterpart Moon Jae-in agreed on Tuesday to completely remove the limit on the payload of Seoul's ballistic missiles, a move aimed at building up their joint deterrence against provocative North Korea.The agreement came at a meeting between the two leaders at the South Korean presidential office Cheong Wa Dae as Trump arrived here earlier in the day on a state visit, becoming the first US President to do so in 25 years. "The heads of South Korea and the US reached a final agreement on removing the limit on missile payloads," Moon said in a joint press conference with the US President, Yonhap news agency reported.The leaders also agreed to expand the rotational deployment of US strategic assets to South Korea and its surrounding areas. "We also agreed to immediately begin negotiations on South Korea's development and acquisition of the most advanced military surveillance assets," he added.Moon said he and the US leader reaffirmed their resolve to peacefully end the North Korean nuclear standoff. They, however, stressed the importance of having what they called "overwhelming" strength over North Korea.In coming days, three US aircraft carriers, accompanied by guided-missile destroyers and submarines, will be conducting a mock battle in the waters in the region, said the US Navy." We are showing great strength and I think they (North Korea) understand we have unparalleled strength. We sent three of the largest aircraft carriers in the world (to the Korean Peninsula) and a nuclear submarine is also positioned," Trump said. "We hope to God we never have to use the military strength the US has on the Korean Peninsula. ""With that being said, I really believe it makes sense for North Korea to come to the table and make a deal that is good for the people of North Korea and people of the world," Trump said.The US President said his country and South Korea will continue to work together to defend what they have worked so hard to build. "We cannot allow North Korea to threaten all that we have built. We have built it very much together and we are very proud of it, also together," he said.Trump's trip to the country came about two months after the North staged its sixth and most powerful nuclear test so far on September 3.The US leader urged all countries, including China and Russia, to faithfully implement UN Security Council resolutions aimed at punishing and isolating the communist state. "All nations must implement UN Security Council regulations and cease trade and business entirely with North Korea. It is unacceptable that nations would help arm and finance an increasingly dangerous regime," he said. Before the talks, the presidential office conducted an official welcoming ceremony for Trump. The two leaders then inspected a 300-member honour guard.Trump said trade issues will be high on the agenda. "We have a terrific meeting scheduled on trade in a little hile with President Moon and his representatives," he said while meeting US troops at Camp Humphreys in Pyeongtaek.Camp Humphreys, located 70 km south of Seoul, was the first stop in Trump's trip to the country. He was joined at the base by Moon for lunch with South Korean and US service members there.On Wednesday, the US President is expected to deliver a speech to the South Korean Parliament before heading to China for the next leg of his five-nation tour through Asia.He is also scheduled to stop at the Asia-Pacific Economic Cooperation (APEC) and Association of Southeast Asian Nations (Asean) summits in Vietnam and the Philippines, respectively.